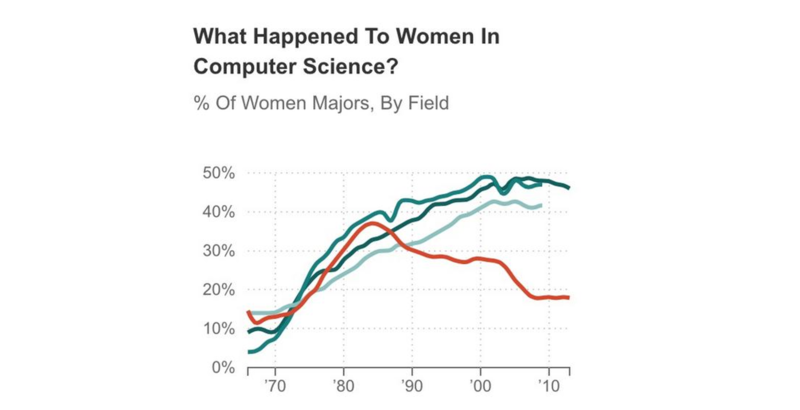 I recently saw this graph at http://www.npr.org/blogs/money/2014/10/21/357629765/when-women-stopped-coding. 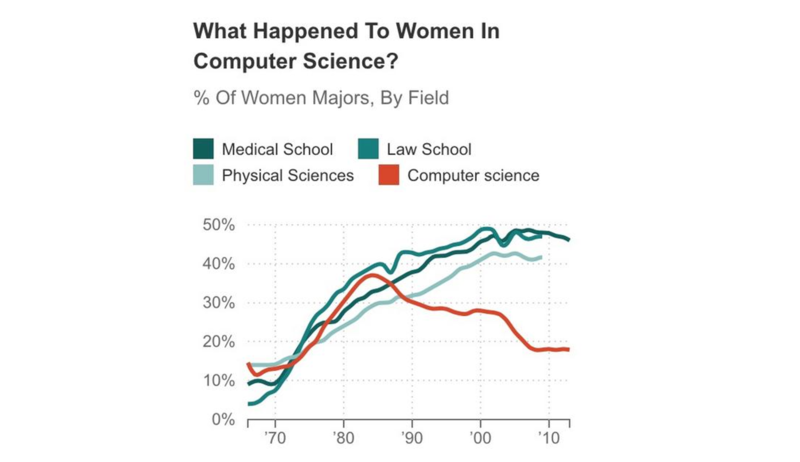 The topic caught my attention but the separate legend about the line graph made me cringe. 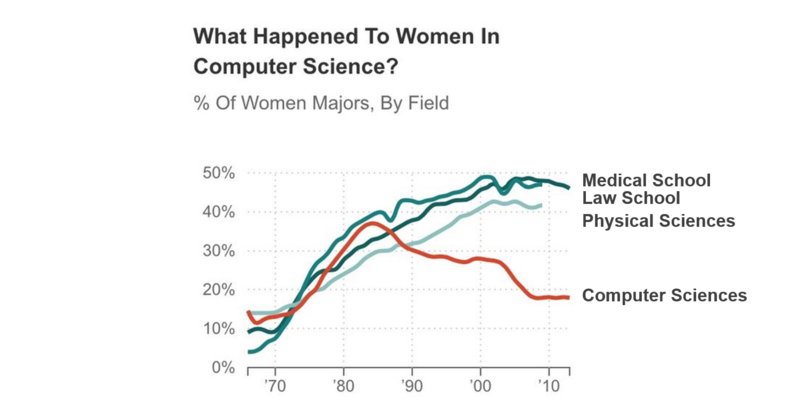 This graph is challenging to read in color (which turquoise category goes with which line?) and would be impossible to read when printed or photocopied in grayscale. These data labels and separate legend score a big fat zero on the Data Are Labeled Directly section of the Data Visualization Checklist. The solution is simple. First, remove the legend. Then, insert those labels beside their corresponding lines. The goal is to get the labels as close as possible to the actual line so that your viewers aren’t zig-zagging their eyes back and forth between the lines and the legend. Format the data labels so that the label contains the category name. In Microsoft Excel, right-click on the data point on the far right side of the line and select Add Data Label. 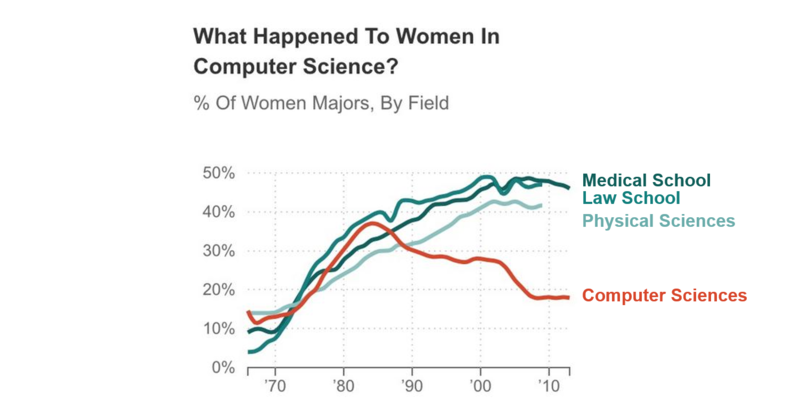 Then, right-click on that same data point again and select Format Data Label. In the Label Contains section, place a check mark in either the Series Name or Category Name box. Insert text boxes next to the lines. There’s no magic behind text boxes; insert the as you normally would just like when you’re using Word or PowerPoint. Text boxes take a few seconds longer but give you greater flexibility than traditional data labels in terms of placement. Finally, for bonus points, color-code the labels so that they match their lines. Use turquoise for medical school, law school, and the physical sciences, and use red for computer sciences. Direct labeling! A small edit for you and a huge advantage for your viewers.